We all need a little lift every now and then — even your email marketing. In an increasingly digital world, emails are vital drivers of conversions. As a result, it’s crucial that your campaigns are fine-tuned and perfected. But how? You might have heard of the LIFT model before. It’s a valuable way to identify where your marketing is falling short, as well as revealing what areas are losing you conversions. No matter what industry your business occupies, you’ll be sure to benefit from a little self-evaluation with the LIFT model. To join the vast ranks of businesses who have reaped the rewards of the LIFT model today, read on. What is the LIFT model? LIFT stands for Landing Page Influence Function for Tests. Developed by digital marketing expert and CEO of WiderFunnel Chris Goward, it provides a framework for optimising conversion for your marketing. The LIFT model has a proven track record of increasing conversions for businesses from a range of industries. But don’t just take it from me — there are plenty of real-world examples of the LIFT model boosting conversions. For example, home renovation retailer BuildDirect saw a sales increase of more than $1 million a month since using the LIFT model to enhance their website homepage and search results. And mobile signal booster business weBoost also benefited from implementing the LIFT model. By evaluating and altering their home, category, and product pages, weBoost saw a conversion rate increase of 100% year-over-year. 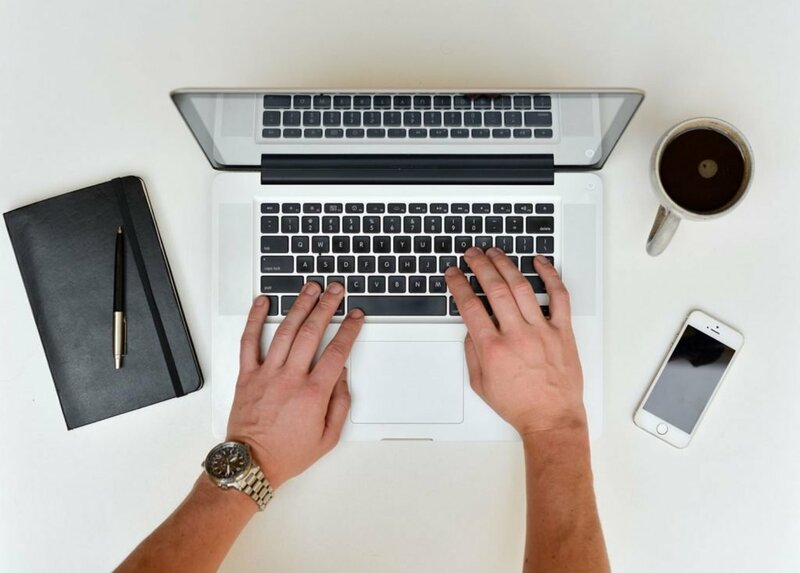 By considering this interplay and using these six factors as a benchmark for evaluating your marketing, you can adjust and amend your emails and see a marked increase in conversions. To help you better understand the LIFT model and boost your email conversion rates, let’s break it down into its core components (and how you can improve them). This is the single most important factor that will affect your conversion rate. Your value proposition is the unique value that your business provides to your customers or clients. To find this, you need to scope out what your target market needs, and how your product or service meets that need. For example, personal finance tool Digit has a value proposition of helping its customers save money without thinking about it. It recognised that people need a way to accrue savings without having to make a conscious effort to budget and plan according to their daily spend — so Digit provides a service that does it for them. By identifying and fleshing out your value proposition, you can understand how the rest of the LIFT models work in relation to your business and implement a solid email strategy as a result. 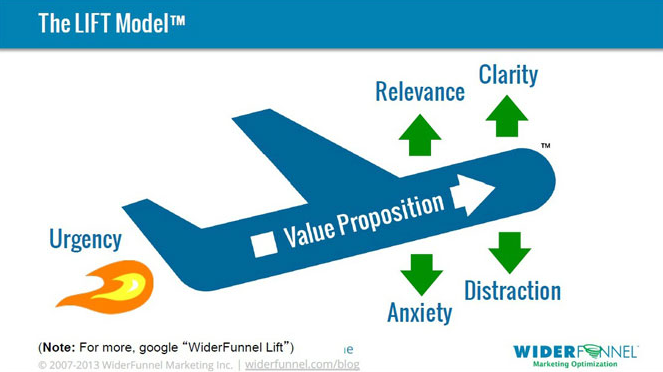 Relevance relates to whether your email relates to the viewer’s expectations, and it’s tied to your value proposition. Using language or images that contrasts with your business’s value proposition will jar with your customer, losing engagement with your email. For example, if I received an email from Coca-Cola that used the brand colours of Oreo rather than their iconic red and white theme, I would instantly be on my guard. Put simply, the content of your email has to embody and continue your brand and its value proposition. Creating brand and content guidelines that your team should follow is a useful way to prevent this by fostering relevance. If your email marketing isn’t relevant to your audience expectations of your brand, you’ll miss out on those vital conversions. The clarity factor refers to how clearly your email conveys your value proposition. While your email copy and imagery might be relevant, if it’s not clear and concise, it will fall short of its goal. Clarity can be broken down into two broad areas: design and content. Your design is related to your user experience (UX) when they’re reading your email. A strong email design guides the reader down a coherent path, digesting information in the order that you want them to. 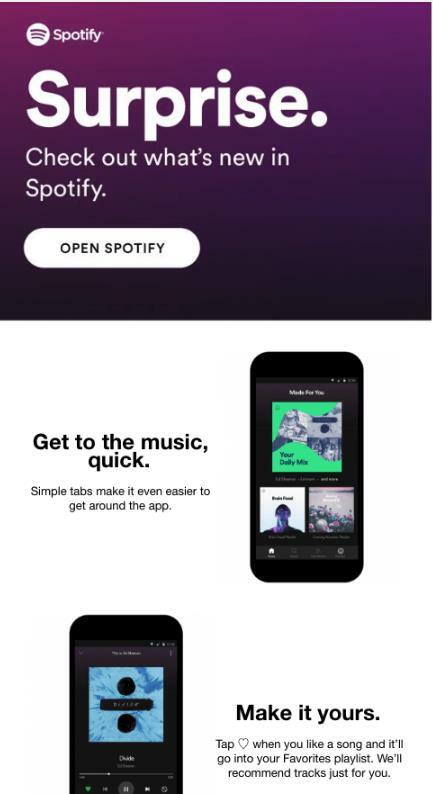 The email structure guides the viewer down a vertical path, facilitated by a careful placement of relevant text and imagery side-by-side. The use of negative space helps focus the reader on each different component, reducing visual noise that might distract them. Create a minimalist design that is uncluttered and linear — doing so will foster clarity in your email, in turn facilitating further conversions. Your content clarity relates to the semantic harmony between the text and images that make up your email. To that end, take the time to hone and fine-tune your copy to perfection. Avoid long, rambling sentences or dense blocks of text, as this can negatively impact your email UX. And try to be clear in what you’re saying — while interesting, playful copy can help to engage your readers, it’s easy to get bogged down in trying too hard to impress. Remember: your emails need to convey value. A crucial part of conveying your value proposition is through creating a sense of urgency. Urgency is a hugely powerful driver of conversions, and can be conveyed in a variety of ways. Email countdown timers can be a useful method of generating urgency in your email marketing. For example, a simple simple countdown widget that indicates when a sale or special offer will end is a tactic used by ecommerce retailers everywhere to great effect. 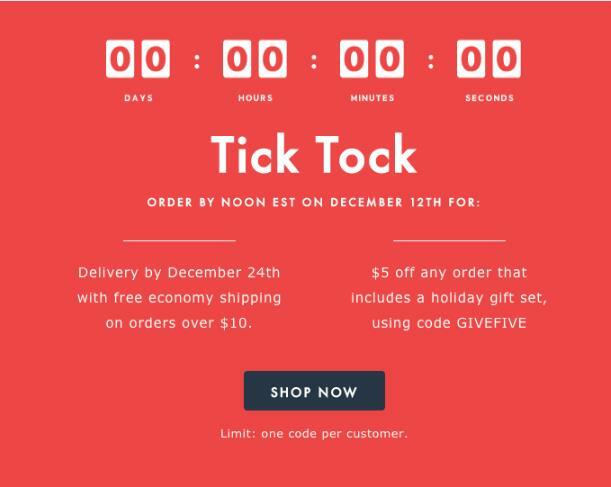 A countdown timer, complete with the ominous “tick tock” below, combined with a strong, imperative “SHOP NOW” really makes you feel you’re going to miss out if you don’t act urgently. Anxiety inhibitors refer to the fears and concerns that a consumer might have before making a purchase or signing up to an email subscription list. These doubts can prevent them from converting, so need to be addressed. An example of an anxiety in an ecommerce environment could be a customer’s concern that the payment process is unsafe, and that their banking information could be compromised. In your emails, it might be that they feel your email is spammy, and that their computer security might be at risk if they click through to your landing page. Anxiety is a significant conversion inhibitor that can easily lose you conversions easily — but it’s fixable. Reassure your customer throughout your email. Testimonials and social proof are ideal for reducing anxiety within your audience. Approval from a genuine and independent source can help give you credibility and assuage any consumer doubts. If you’ve done your target market research, you’ll know your customers inside and out — and you’ll know their anxieties too. Address them in your email marketing, and you’ll reassure your customers before they’ve even realised it. Finally, you should eliminate distractions in your marketing. Retaining your customers’ attention in the digital sphere can be a difficult task, with distractions abound and taking many forms. Reducing distraction is a delicate process that requires serious thought. A messy layout, loud colour scheme, an excess of call-to-actions are just some of the factors that can side your reader and prevent them from converting. While distractions come in many shapes and sizes, there are a few basic elements that you should consider. Firstly, be frugal with your links — too many options decreases the likelihood that they’ll click on any of them. No more than two call-to-actions per email, and focus them on specific goals you want to achieve. Avoid using too many images too, as this creates a visual noise that can deter the reader from your true goal. The best emails rarely contain more than two high-quality (and relevant) images each. Think about your audience perspective when you’re evaluating your emails or seek a second pair of eyes. It might also help to use an eye-tracking solution to see where your readers are looking, as these are often great for identifying any distracting elements that you might need to prune. Using the LIFT model with your email can help increase conversions and enhance your marketing. Chopping and changing different elements and split-testing them gets the most from your marketing strategy. But don’t sit on your laurels — you should continually experiment with your emails to always strive for the best. 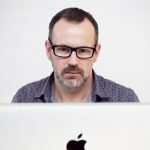 Patrick Foster is an editor at Ecommerce Tips, covering everything the aspiring ecommerce entrepreneur needs to know. Marketing, product management, content creation — you name it, Ecommerce Tips has you covered. Find him on Twitter today @myecommercetips.